* Paul's only sibling is an older sister. Brooklyn. He was born in Manhattan and then moved to Queens as a teenager. * Paul went to the prestigious New York High School of Music and Art. He then became an art major at the Bronx Community College. sandwich: cream cheese & grape jelly....cut diagonally! not him and changed it back to the star design. "C'mon and Love Me." 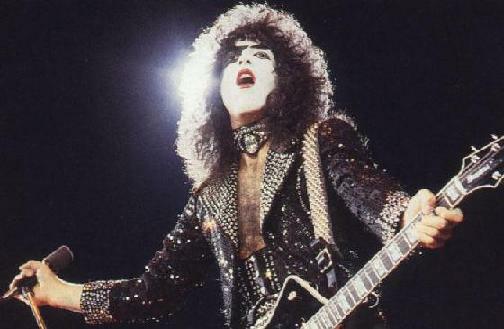 He's also played solos on songs, such as "I Want You,"
Go 'Round," "A World Without Heroes," and "Psycho Circus" to name a few. highly responsible for his success. turned it down for not relating to the band on a personal level. as a patient who swallowed a microphone on stage! Donna Dixon and model/singer Samantha Fox. which causes him to cancel a couple of performances. Paul's page has been visited times.